BANGKOK: The Royal Thai Army panel investigation into the Rajabhakti Park project has found no evidence of corruptuion, the army commander-in-chief announced today (Nov 20). Gen Theerachai Nakvanich said the committee found no irregularities in all organisations and persons operating the project. “The operation was transparent. All incomes and expenses matched. But if we find outsiders are skimming money from the project, we’ll take action,” he told reporters in an informal session where live broadcast was not allowed. The army set up the panel a week ago at the height of the project’s corruption scandal, presumably to look into the allegations. When asked on Friday what exactly the committee had probed, Gen Theerachai said it was set up to look into the accounts of the project. The general, however, refused to give details at the heart of the scandal – the alleged commission fees some contractors claimed to have paid. Instead, he told reporters to ask his predecessor, Gen Udomdej Sitabutr, since the irregularities had happened before he took over. 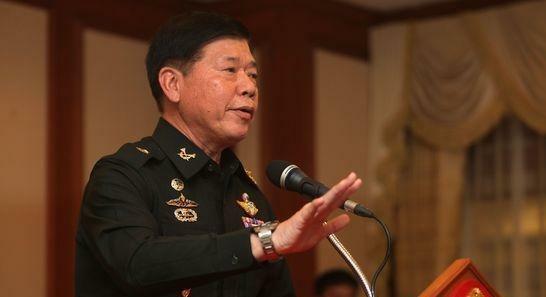 He also insisted no military officers, including the fugitive Col Kachachart Boondee, had been involved in the alleged corruption but the colonel might face other charges unrelated to Rajabhakti. “There is an outstanding 33 million baht in donations [to the army] now, excluding the funds held by the Rajabhakti Foundation, which is a separate entity. He also urged the public to apply discretion when reading the news, especially on social media, and to not believe in everything they read. The army will continue to look after the project. He confirmed as true reports about a fund-raising event where a Chinese-food table cost B1 million each, as well as the palm-tree planting activity where a donor paid B300,000 to have his name on a tree. “However, these are the army’s affairs and we don’t need to involve anyone including the National Anti-Corruption Commission or the Comptroller’s General’s Office,” he said. Located on army land in Hua Hun district of Prachuap Khiri Khan, the 222-rai park showcases the statues of former Thai kings. Seven have been built to date. The construction was financed by public donations. There were reports last month about possible corruption in the project’s construction after the casters of the statues told police they had paid millions of baht in commission fees to a civilian who sat on the construction committee. Col Kachachart, a former aide to Gen Udomdej, and a major general were also reportedly involved. The colonel was rumoured to have been in custody this week but authorities denied the reports, saying he remains on the run. What's the point ofd having the Army investigate...? The fox watching the chicken coop.... so of course there's no wrong-doing.